This publication traces the arc of Hudson Valley–based artist Tanya Marcuse’s (born 1964) work over a 15-year period. Fueled by the Biblical narrative of the fall from Eden, these projects use fantastical imagery to explore cycles of growth and decay and the dynamic tension between the passage of time and the photographic medium. The first volume, Fruitless (2005–10), features serial photographs of fruit trees near Marcuse’s home in the Hudson Valley. Repeatedly photographing particular trees from the same vantage point, Marcuse catalogs seasonal transformations; the fallen apples become more prominent as the work progresses. In the second volume, Fallen (2010–15), Marcuse imagines the landscape of ruin in Eden after the exile of Adam and Eve. Using fruit collected from beneath the trees of Fruitless, Marcuse depicts an ordered paradise becoming wild and untended. Volume three, Woven (2015–19), takes Fallen’s dense arrangements of flora and fauna to a newly immersive scale, with 5-by-10-foot tableaux that converse with medieval millefleur tapestries. These exquisitely detailed photographs evoke a Boschian world of allegory and fable. Essay by Francine Prose. Published by Radius Books. Entries on Eden imagines the state of the Garden after the Fall of Adam and Eve, and surveys the rampant growth of human knowledge, from the ﬁrst bite of the forbidden fruit to the encyclopedias and Wikipedias of today. Entries on Eden intermingles lush photographs by Tanya Marcuse with text by her daughter, writer Eve Romm. The text is excerpted from the Encyclopedia Britannica, an emblem of exhaustive, objective knowledge, but whose language contains religious allusions and rich symbolism as it is transformed into concrete poetry. The photographs too, function as both evidence and allegory. Limited edition of nine numbered and signed copies, and two artist’s proofs. Photographs copyright Tanya Marcuse 2016, text copyright Eve Romm 2016. Ten Decompositions is a twelve-page softcover publication that measures 15 x 21 cm and is fastened with two omega points. 100 numbered copies, available for sale through 0-100 Editions at the link below. Click here to purchase Ten Decompositions. 0_100 Editions is an independent publishing project dedicated to produce strictly limited edition photographic wordless stories. Believing in the photo book as a form of art, 0_100 Editions is characterized by a minimal typographic approach. By using different formats and techniques, 0_100 Editions gives the utmost importance to the picture itself. The whole 0_100 Editions collection has been acquired by the MoMA Library. Undergarments and Armor is a monograph by Tanya Marcuse, presented as three hardcover cloth-bound volumes within a slipcase. With an essay by Valarie Steele, published by Nazraeli Press, 2005. 112 pp., 53 duotone illustrations, 6½x10½"
First edition copies are sold out, but used and new volumes can be found on Amazon and Ebay, or contact the artist. 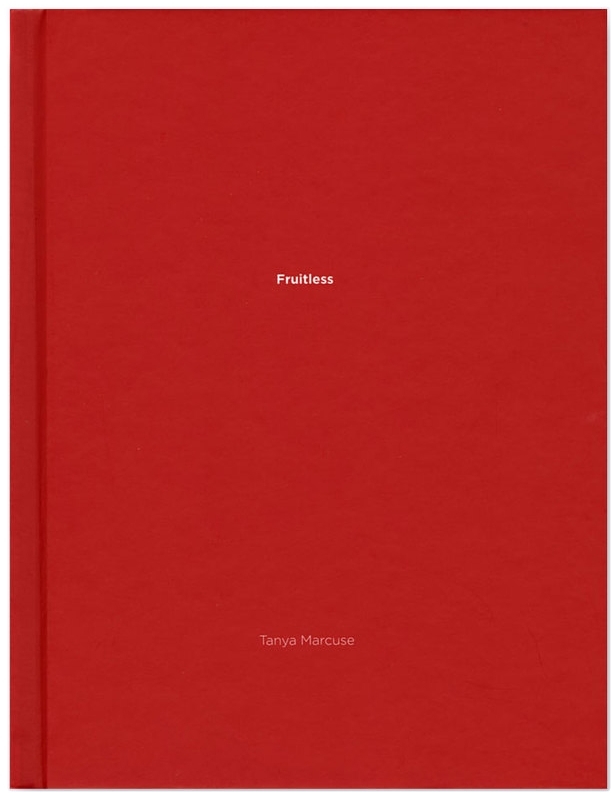 Fruitless is a hardcover monograph by Tanya Marcuse published by Nazraeli Press as #42 of the One Picture Book series. 16 pages, 9 duotone plates, 1 original prints. 5 1/2 x 7 1/4". Available for sale by Nazraeli Press. Published as part of the 2014 exhibition of Fallen at the Julie Saul Gallery, this exhibition catalogue includes 18 pages and 10 plates with text by Tim Davis. Portfolio of sixteen 17 x 22" prints. Edition of five. Portfolio box lined in black Japanese silk by Culpeck & Clark Limited. 2012. 1/5 Acquired by The Beinecke Rare Book & Manuscript Library, Yale University.